Menelik Wossenachew was from Addis Ababa, Ethiopia. There is not a lot of information available on him. He did record at least one other single for Ahma Records, with The All Star Band that was written and arranged by Mulatu Astatke. Menelik Wossenachew was a member of the second incarnation of the Ras Band, which was lead by Girma Beyene. The Ras Band took their name, like The Ghion and The Shebelle Bands of the time, after the hotels that employed them. who was then led by the famous Armenian Nerses Nalbandian. These included Girma Beyene, Wodajeneh Felfelu, Assefa Bayisa, Tefera Mekonnen, Tilahun Yimer and Bahru Tedla. Up to 1955 the last three were also in the Imperial Bodyguard Orchestra Jazz Symphony under Austrian Franz Zelwecher. The first Ras Band stayed in this form until 1965 when the entire band, with the exception of Girma Beyene, went on to form the Ghion Band at the Ghion Hotel. Girma Beyene, was a lyricist, a music writer, an arranger, a vocalist, a pianist and bandleader. To most, if any name comes to mind with the word arranger, it is probably that of Mulatu Astatke. Yet, according to Ethiopiques Series producer Francis Falceto, in the heyday of vinyl records, Girma Beyene is credited to having arranged close to 65 titles, compared to Mulatu’s 40. Girma left a handful of recordings as a vocalist, but it was as an arranger and pianist that he is most remembered. After leaving the second incarnation of The Ras Band, Girma Beyene was in The Girmas Band with Girma Zemariam for a brief period before forming The All Star Band in 1970. It members were for the most part taken from two popular bands, the second Ras Band, and The Soul Ekos Band with Menelik Wossenachew on vocals. But that only lasted for two years, before Girma Beyene left to form the Alem-Girma with Alèmayehu Eshété in 1972. 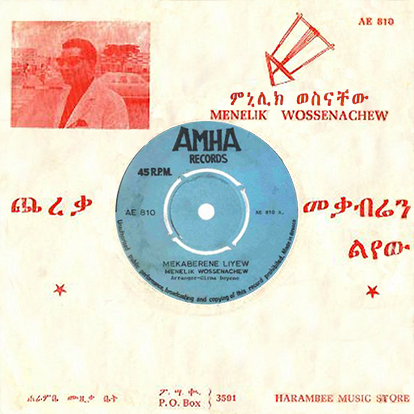 Catalog number AE 810, Amha Records of Addis Ababa, Ethiopia. No release date given. It seems that all those funky colored/psychedelic 45s have some wicked breaks on them!!! !